Contact sales@interactiveastronomy.com or call 510-495-7932 before ordering regarding cable length. 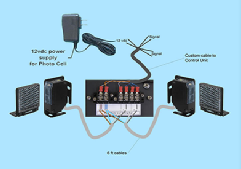 Contact sales@interactiveastronomy.com before ordering regarding cable length. *All prices include free shipping in the continental USA. Sales tax additional where applicable. 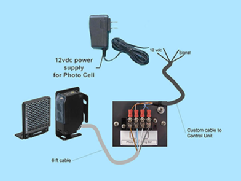 For installations requiring more than two Photo Cell kits, contact sales@interactiveastronomy.com or call 510-495-7932. 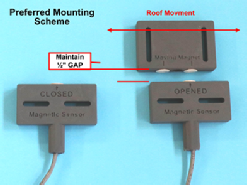 This magnetic sensor set is required for the SkyRoof controller. The set is custom designed using (2) very strong magnets that will provide a highly reliable switching over a 2" wide magnetic field zone. Operates most effectively with a 1/2" gap. Sensors and magnets are waterproof for indoor or outdoor mounting. Sensors and magnet block are approximately 1.25" x 2.50" x .50" thick. *Contact sales@interactiveastronomy.com or call 510-495-7932 before ordering regarding cable length.